What is it? – Meeblings 2 is the second installment in the fantastic action-puzzle series were you shepherd google-eyed creatures to the exit of each level using their unique powers. Who made it? 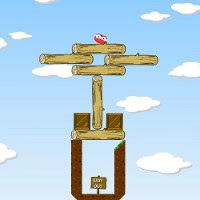 – The game was developed by NinjaKiwi. How does it play? – Meeblings 2 plays much the same as its predecessor. You’ll need to herd a certain number of the colorful Meeblings to the exit sign in each level. Orange “Feeblings” are neutral, and cannot be interacted with directly. Yellow “Herelings” attract all other meeblings when clicked, and blue “Therelings” repel them. There are nine types of Meeblings in all, and their powers will affect things like the level’s gravity or electricity. The “Chameebling” (a dark green Meebling with a hat and sunglasses) can be changed into any of the other types. Presentation – The presentation is great. The physics are squishy-fun, and the protagonists are as cute and colorful as the little noises they make. Positives – The game is incredibly charming, though this should be no surprise to those who have played the original. The inclusion of 50 different levels gives the game more legs than your average title, and the level design and different unit-types keeps things fresh throughout. Negatives – You may often figure out the solution to a level long before you’re able to complete it. Moving the critters around the level isn’t very precise, sometimes resulting in the feeling like you’re using an axe to do the job of a scalpel. The imprecision feels intentional to me, and doesn’t feel unfair; however, you may find it frustrating. Why you should play it – Meeblings 2 is cute, fun, addictive, and lengthy experience. It’s a superb sequel to a great game, and is full of variety and charm. Despite its sugary-sweet presentation, it’s a fairly deep physics-based puzzle game with a ton of variety that should appeal to a wide range of gamers.